This week it’s been back to normal, and back to work at home on different projects! I’ve been focusing on creating a new presentation that I will be giving for the first time at SDE’s Arkansas Kindergarten Conference on December 2, 2011. Since the handout is due this week, the presentation itself must also be mostly finished, so I have been having some fun working on that. In order to accomplish this task, I have been going through all of my picture and blog files, and trying to pull into one single computer folder all of my guided drawing activities that I have. Boy, there’s a LOT of them! Actually, I am very pleased with the way it is coming out; I think that this session will really be a FUN one! I am going to have the participants drawing along with me, and then I’ll be showing them pictures of the children's work. I did a little bit of guided drawing in my “Singable Books to Make and Read” session at the SDE Minnesota K Conference last week, and it was great fun! The participants were all giggles as they drew David Shannon’s “No, David!” character along with me. (I think they were teasing each other on how their drawings were coming out, but that only made the session a little bit more fun!) In any case, I had a wonderful time with it, and Ithink they did, too! By the way, you can find the directions for the “No, David” guided drawing activity here. You can also write the words “Guided Drawing” into the “Search This Blog” box at the bottom right hand side of the screen, and find gobs of other guided drawing activities! As I create more, I’ll be posting them on this blog. The kids sure do enjoy them! DVD’s vs. CD’s: Which are better? Answer: I use both, but from what I hear, most people that have a player and a good TV, a projector and screen, a Smart Board or other type of interactive white board are usually happier with a DVD. This is because they can easily show the movements on the screen, and the kids can follow along nicely as a whole group. They can even see the “target word” on the screen and read the lyrics as they scroll along, too! 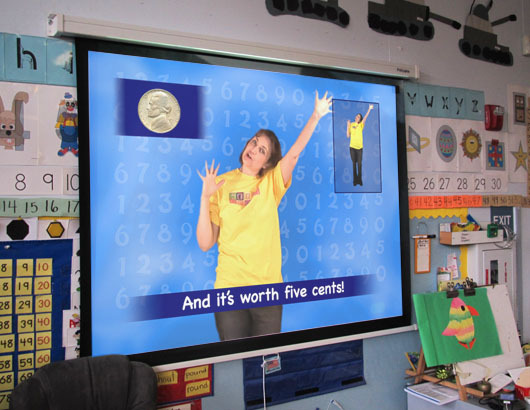 It’s a nice set-up, and it is multisensory, so it should help children with many different learning styles. With all the HeidiSongs DVD’s, you can start at the main menu and then decide if you want it to play the whole thing through by using your remote and selecting “Play,” or you can select a specific song to hear by selecting “Single Songs” instead. If you select “Single Songs,” you see get a song list. By selecting the song you want, you can skip straight to that song quickly without losing your class while you try to find the “Word of the Day” that you are trying to teach. The main advantage to using a CD is that CD’s are quick and easy to use, especially if you use an iPod or other digital music player. You don’t have to spend much time navigating through a DVD menu to find your song; you just advance your CD to the correct number as it is listed on the back of the CD case. 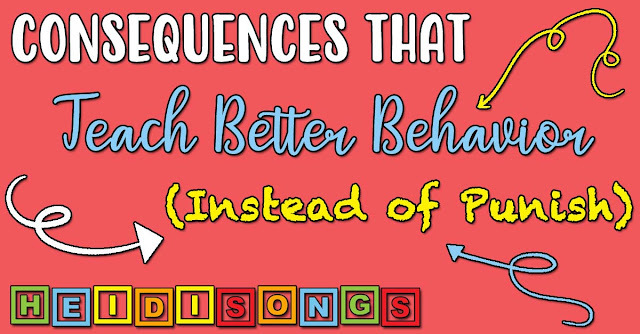 The disadvantage, of course, is that you will need to either make up your own movements for the songs, or download my movements from the website, take the time to figure out what they mean, and practice them a little bit before you introduce the song to your class. The other option would be to buy both the CD and the DVD, and then use the DVD to teach yourself the movements at home, for example. Then when you are comfortable with them and you have them memorized, teach the song at school with the CD. This of course costs more, but takes less time. 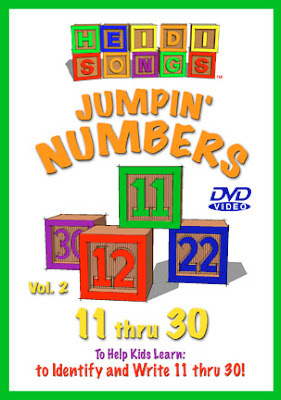 Some teachers use the DVD in class to introduce the song, and once it seems that the children have it, they switch to the CD version to save time. These are all good ways to go about it; you just have to find the one that works for you! DVD's have both music and video (like the video samples you see on our website), and will play in any standard DVD player, including your computer. If you are not sure if your computer will play a DVD, just pop one in and try it. Some older computers might need to have some player software installed to use a DVD, so you might have to check with your district's Tech Support to help if it does not play. However, you cannot put a DVD into a CD player and expect to push “play” and hear sound coming out as you would with a CD. It's a basic format issue, so that is not going to work. Click here to shop an external DVD drive! Answer: I store the Velcro Books by the CD that they go with, but that works for me because I can easily recall which words go with which CD. They are in plastic tubs and are labeled. The children are only allowed to use them when I get them out as a center, because I find that when I leave them out continuously they tend to lose interest and they cease to stay "special." Also, we lose more pieces that way. I prefer to put them away at the end of the day or the couple of days that we have used them. Then I make sure that all of the pieces are there, and then put them away. I do not number them, but I know of others who swear by that and do recommend it. I do not put the sight word workbook pages out with them, because we do them separately. I do have a routine each week that I follow to make sure that I use the supplies, and I am outlining it below. There are always exceptions, and other things that I like to “throw in there” just for fun, (like seasonal games that I talk about and give away on my blog) but this is my basic plan for the independent center table in my room. In other words, this is what the children are doing while I am pulling small reading groups. Group One: One group of children does a reading group with me. Group Four: One group of children does these independent activities together at my “yellow table.” Or, they sit down on the floor near that table to work whatever I’ve given them. OR, for that day only, their “yellow table” activity may be going outside for a Motor Development PE activity with a volunteer. Read below how I rotate the kids through the activities. * On Mondays, they play bingo, either CVC, ABC, number bingo, etc. One of my volunteers runs this center. If one of my Monday volunteers did not show up, I defaulted to “Plan B.” Read below for Plan B! * On Tuesdays, they do one of the cloze activity Sing and Spell Worksheets, and then they practice writing their sight words and CVC words with a volunteer. * On Wednesdays, they do Motor Development outside with a parent volunteer every other week, and on the off weeks, they do the Velcro Books or Sight Word String Ups. * On Thursdays, they do the Sing and Spell Puzzles, one of my "Bang" style games with a volunteer, or one of the Mini Sing Along Songbooks. (My volunteer help on Wednesdays and Thursdays was sporadic last year, so what we did really depended on whether or not I had help.) Again, If one of my volunteers did not show up, I defaulted to “Plan B.” Read below for Plan B! * On Fridays, we have Book Buddies, so we don't do centers on those days. 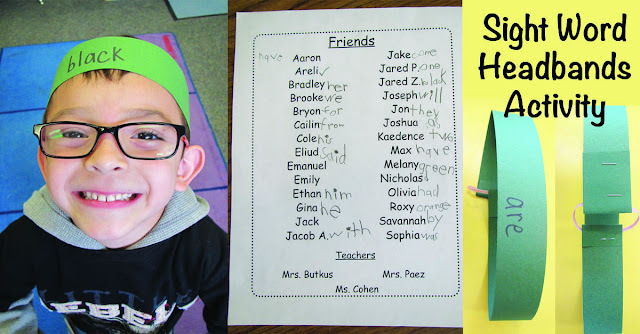 Or, if we do centers, our Book Buddies are going from center to center and doing the activities right along with us! That is REALLY fun, and the older kids really love it! Plan B: Of course, I always also have a “Plan B!” If a volunteer doesn’t come for some reason, I can always give the children one of the manipulatives that I have in the room, such as puzzles, magnets, plastic animals, playdough, etc. I also keep a stack of easy, “throw-away” types of coloring pages and worksheets that I can give the kids, just to keep them busy if I need to do so in a pinch. 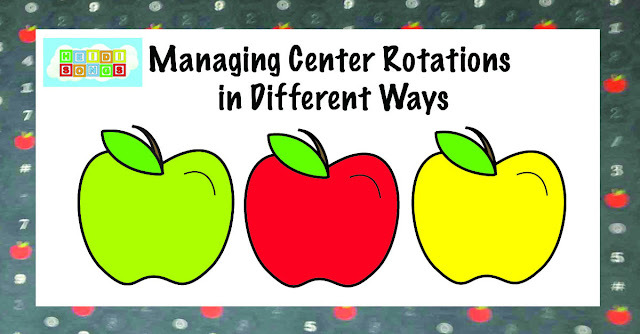 Your center rotation sounds great, I am wondering if you do the 4 centers rotation all in one day or 1 each day? We do the centers all every day, but again- I have a three hour aide daily! I know that this isn't possible for everyone. It sounds like all of your class rotates through to the teacher table each day. Does each rotation last 15 minutes? - playing with a selected manipulative that I have put out, etc. I rotate in and out the things that each table group can do when they are done to keep them fresh. Also, it has to be something that they can do very near to the center that they were at. I prefer that they keep that activity right at the same table where they were working before, because I find that the troubles come when they leave their group and form a new, independent "cluster" on the floor somewhere and wind up getting rowdy or something. They will stay under control (usually!) as long as they are right there with the adult. If there is nobody there with that group at that table, then they definitely have to stay there when they are done, and the thing that they may do when they are finished will usually be simply read a book at the table. I don't want them to rush through it so that they can goof off together on the floor somewhere alone where I can't see them very well, like behind the cubbies! And the more attractive that I make the "go-to" activity when they are done, then the more likely it is that they will rush through the activity they are doing independently to get to it. And that was never the point, was it? I'm really seeking to improve the structure of my centers this fall. I will be going from a half-day program to a full day one. I hope to have groups in the morning and groups in the afternoon. I will have an aide for most of the day--but no volunteers that I can count on to supervise a center on a regular basis. Do you think I could make your system work with 2 centers really being independent? With RTI requirements, I need to meet with some students every day. Do you meet with every group each day that you do centers? At my school, there are five K teachers, and there are always days when some of us have no volunteers at all. We learn to get by. There are years when we have volunteers maybe two days per week and never any on the others. And the days that we do have them, there is only one person, not two. When this happens, the art projects are MUCH simpler. The children learn to set up for the next person, too. That is part of their responsibility. The teacher at the reading table knows that she will get a little less done, due to the need to stop a bit earlier and help them finish up if necessary and get ready for the next group. 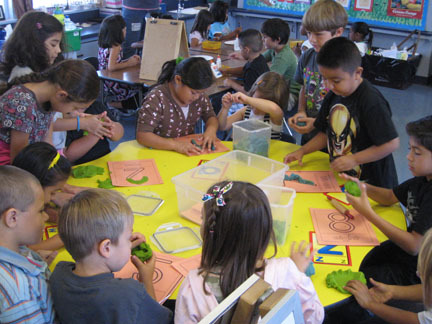 Usually, at the fourth independent table, the teachers with fewer volunteers do what they refer to as "Mini-centers." So when they get to that station, the children split up and go to individual mini-stations. Two of them might go to a listening center, two to a computer center, and two might go to puzzles or a science center, and so on. Their names are posted at each mini-center and rotated each day, so they know where to go. They go with a partner, and they are divided up so that two kids that are "bad news together" are never sent to the same mini-center together. That usually works out fine. I would highly recommend this type of arrangement if you lack volunteers but do have an aide. That way, you can let them do some art independently, then do mini-centers independently, and then you can do reading groups, and your aide can do math. You can always switch back and forth with reading and math as you wish. I almost always do reading and let my aide do the math, but then might do some more whole group math lessons in the afternoon (or in the morning before groups start) to make sure that my kids are getting some math instruction from me. It helps a lot! 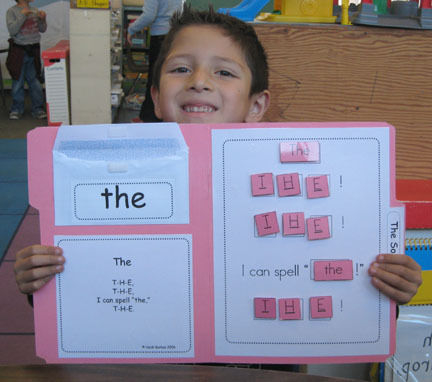 do you have a template for your sight word folders? I love the idea. Yes, those sight word folders are sold on my website. I'm not sure if you are referring to the Sing and Spell Puzzles, or the Velcro Books, but they go along with each Sing and Spell CD. So if you go to the web page for each CD, and then scroll down, you will find where to buy each of them.